Anthony was born into a nominally Christian home in 1932. He attended school during the war without any spectacular academic record. He left at 14 years to become an apprentice jig and tool maker. Dismissed because he registered as a conscientious objector he entered nurse training at eighteen. Two years previously he became a Christian and said that this experience transformed his life. 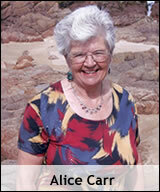 Knowing the calling of God to nursing he qualified as a Registered Nurse in 1954. He married Alice in 1955; they had previously met while both were taking nurse training at Selly Oak Hospital Birmingham. Alice is a nurse and midwife. They have five children and eleven grandchildren,two adopted ones and their first great-grandson was born in 2013. Anthony has two other brothers, both in the Christian ministry. Revd. Dr. Michael Westwood Carr is senior minister of the Harrow International Christian Centre while the Rt Revd. Dr. David Edward Carr is the senior minister of the Renewal Christian Centre Solihull and Bishop/Abbot of the Archdiocese of Wroxall Abbey Warwickshire and the Order of St. Leonard. 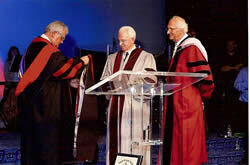 The picture shows Anthony receiving the Doctor of Sacred Literature from Logos Graduate School. The University is in America so the presentation took place in the Renewal Christian Centre, Solihull and David (left) gave a background to Anthony's spiritual activities and presented the degree and Michael (right) gave the main oration.